It’s quite a daunting task to explain anything in theoretical physics in 250 pages, but this is just what I like about Carlo Rovelli’s books. Earlier this year I read The Order of Time, and like that book, Reality is Not What it Seems gets right to the point. No time is wasted or point too embellished. 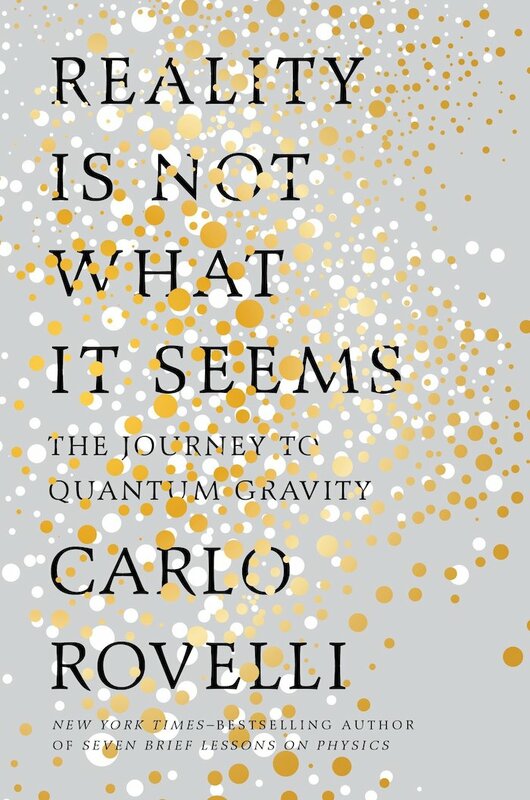 This time around Rovelli tackles his specialty: quantum gravity. While it is a work of popular science, he does an admirable job of explaining wildly complex theories — made all the more difficult because a cumulative understanding in sequence is required to keep following the thread. About half of the book is devoted to the scientists and their discoveries that lead to the two most important scientific theories we’re still building on today: general relativity and quantum mechanics. But we can’t understand the origins of those breakthroughs without starting at the beginning. Rovelli relishes the story of the great thinkers that each contributed stones to building the great structures of science we’ve erected today in modern physics. Anaximander, Democritus, Aristotle, and Galileo all play a role in establishing the foundation that propelled Isaac Newton to the discovery of what we know know as classical mechanics. His laws of motion and gravitation were the bedrock of physics for 200 years until Michael Faraday’s work on electromagnetism. The number of amazing discoveries recounted here is astounding, and the profoundness is stark when presented in rapid-fire order, albeit succinctly, which Rovelli excels at. Rutherford, Bohr, Maxwell, Planck, von Neumann, Born, Pauli. The trail leads us to the big players behind the current understanding of the universe, and geniuses behind relativity and quantum mechanics: Albert Einstein, Werner Heisenberg, Paul Dirac, and John Wheeler. The time spent with each of the characters is brief, but meaningful; each of their achievements were astounding, especially given the technology and information each had available1. These theories of modern physics are mind-bendingly difficult to comprehend. Both lie beyond our everyday perception — relativity at cosmic scales, and quanta at the ultramicroscopic. For such a brief baseline, Rovelli does a good job framing up the two with vivid examples demonstrating general relativity’s four-dimensional latticework of space and time, and quantum mechanics’ probabilistic hecticness. The second half of the book builds toward a merger of the two theories in “loop quantum gravity”, which is an attempt (as yet unproven) to merge the two conflicting theories on the nature of reality. The fact that two demonstrably, empirically “true” theories don’t square with one another clearly indicates we’re missing something. Things get quite existential and philosophical, in Rovelli’s lyrical style. Toward the end we even get a look at how thermodynamics and information theory play a role in understanding quantum gravity. I can’t begin to summarize other than to say it involves foam, entropy, Claude Shannon, and the intertwining of heat and time. Where this leaves us, I don’t know. But I’m incredibly curious to continue reading about the subject. I have far from a comprehensive understanding. It’s endlessly fascinating to gain basic pieces of knowledge and feel like I have a better handle on how things work.